From Squamish BC’s Howe Sound Brewing comes the “Megadestroyer Imperial Licorice Stout” a Fall Seasonal beer that was aged for one full year in my Cellar. Big malty beers are great to age and see how they change and transform. The Megadestroyer poured a black opaque colour with a brown head. The aroma consists of roasted malts, licorice, anise, molasses but all of the aromas are mild. The flavours have all mellowed out quite a bit to but consist of hops bitterness, roasted malts, molasses, anise, licorice. There is no alcohol flavour present but there is a bit of warmth still remaining. The alcohol content comes in at 10% and the IBU is rated at 75. This is still a good beer but I was quite sad that the malt flavours and licorice had died off so much. I would recommend drinking this withing the first 6 months to ensure that it still is a Megadestroyer not a minordestroyer. 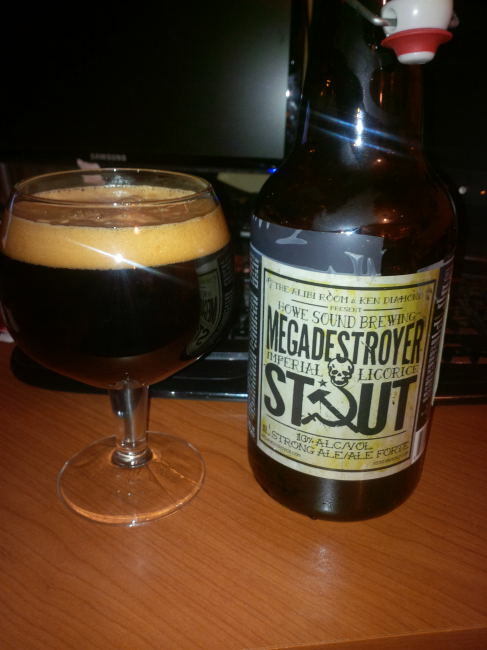 Megadestroyer is one of my all time favourite stouts because of the licorice and this bottle has changed dramatically. Commercial Description: As the name suggests, is not for the faint-hearted. This beer is a strong, hearty stout brewed in a very limited quantity a few times a year. It is brewed with seven different barley malts, blackstrap molasses, hops, water, yeast, licorice root and star anise. It has an intense depth of roast earthy flavour, with a pleasant licorice aroma. Food pairing as per brewery: This big, robust licorice beer goes well with chocolate desserts, oysters and red meats. This entry was posted in Imperial, Stout and tagged 1 year old, aged, anise, bc, bitter, bitterness, canada, hopped, hops, hopy, Howe Sound Brewing, imperial, imperial stout, licorice, megadestroyer, mellow, mellowed, molases, roasted malt, roasted malts, seasonal, squamish, stout.